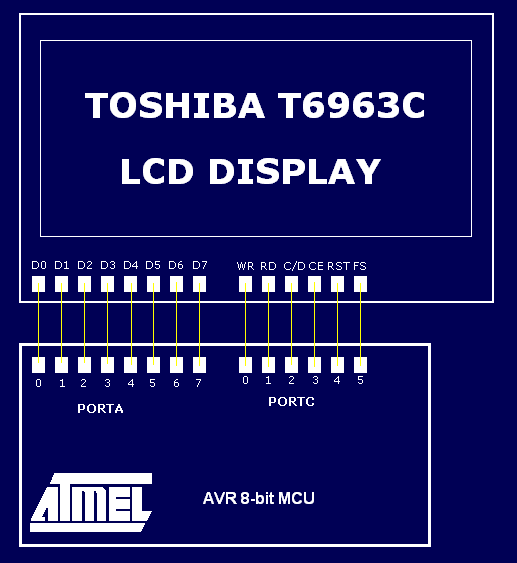 LCD displays with Toshiba T6963C controller are ones of the most popular LCD displays. On this page You will find ready-to-use source code for Atmel AVR microcontrollers written in C language for avr-gcc compiler. Of course, this is very simple schematic without power lines and other required parts like crystal oscillator etc., which You must place in real design. But I think, that isn't problem for You. All source codes are available in Download section. After download all files to folder with Your project and add T6963C.c and graphic.c files to project tree (or makefile) and place in file with the main() function calls to functions which You would to use. How to write inverted text? Text inversion can be done by XORing text area with filled graphic area. Source code for avr-gcc compiler. It can be ported for others compilers and MCU's.